Before I had children, I got a good laugh out of seeing kids in public wearing a tutu or cape over their clothes and acting as if it was a completely everyday occurrence. What, you keep your superhero persona private? Now that I have my own picky 3-year-old, I understand much more about which battles are worth having. I save my persuasive measures for days that I really want Big Sister E to wear the cute jeans and dressier tops that normally just stay folded in her dresser. However, that doesn't mean that I don't want her to be comfortable. It's just that I want a way to infuse a little style and personality into the otherwise same old, same old shorts and t-shirts that she usually wears. What I want is an outfit that is colorful, fun, fits well and allows kids to play like kids. 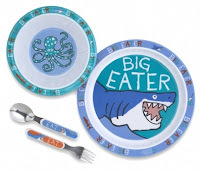 To find that, now I know that I don't have to look any further than the high quality and great designs at Hatley. Started over 20 years ago by a talented husband and wife team selling aprons, today Hatley is run by their three sons and is sold around the world. The success of their colorful and fun aprons led to clothing and gifts and with the growing popularity, Hatley now offers apparel for the entire family and items for multiple rooms of the house. 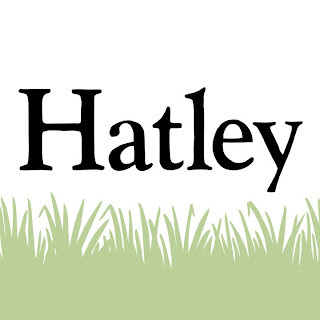 But when it comes to children's clothing, Hatley reigns supreme in terms of well-made, creative, adorable designs. Browsing through their Girls' Play Sets, I knew that Big Sister E would love not only how comfortable they would be, but the amusing patterns and unique style Hatley offers. With everything from dresses to shorts to skorts, the colors and prints would be right in tune with what a child would enjoy. 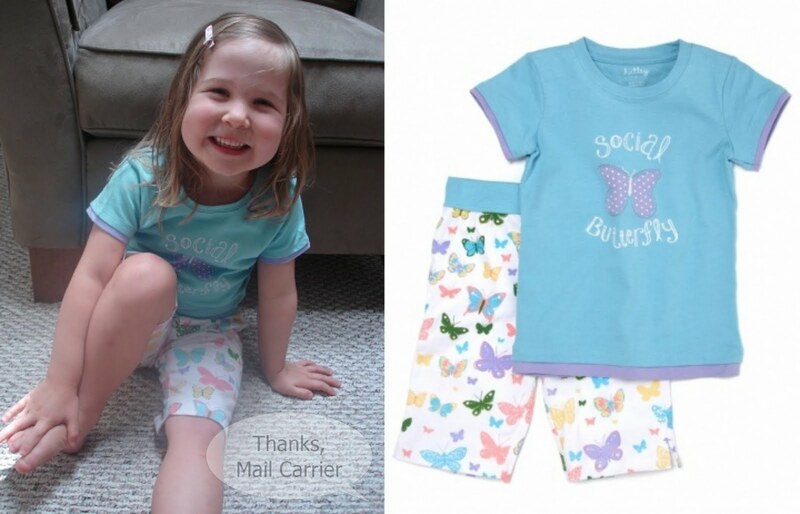 Sure enough, when the Social Butterflies Girls' Play Set arrived, she immediately grinned at the appliqué on the shirt and ran her hands over the soft cotton. 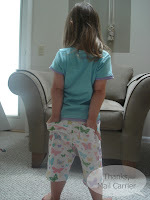 Turning her attention to the knee-length shorts, she proceeded to point out the different color butterflies and that these pants had something she is a big fan of: pockets. Overall, we have gotten great use of this outfit and Big Sister E receives compliments on it whenever we go anywhere. The great length in the shirt means no riding up and the drawstring and elastic waist on the pants ensures that they fit her just right. Plus, the clam digger length is a nice change from the usual shorts that she wears that always seem a little too short on her long legs. The only thing I would change is the opening flap where a zipper would be in the front of the shorts. Considering these are for girls, it doesn't serve a purpose (I doubt it would actually be used by boys anyway) and sometimes gaps open when Big Sister E bends or sits. However, after I get around to putting in a few stitches, the problem will be easily be solved. Speaking of boys, Hatley definitely hasn't forgotten about them as well. There are only four Boys' Play Sets, but each one is the perfect thing for going from the park to a play date and out to lunch while looking adorably handsome. Hatley even has Infant Play Sets! You haven't seen anything cuter than these miniature versions, complete with all the details and trimmings. Whether shopping for apparel for adults or children or for one-of-a-kind dish sets, hilarious oven mitts or greeting cards that are sure to bring out a smile, Hatley has it all. Their high quality, natural fibers and green efforts make this a company that not only has an eye for design, but cares about the environment. Products that are designed to last through years of wear and multiple children from a business who makes thoughtful decisions about how they are affecting the planet? What more is there? To enter to win: Visit Hatley and tell me your favorite product(s). Be warned, there are a lot of cute choices! 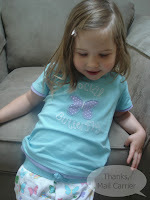 3 Extra Entries if you blog about this giveaway linking back to Thanks, Mail Carrier and Hatley. Please leave an address where it can be found. Giveaway will end on July 8th at 11:59pm CST. Do me the favor of leaving an email address or making absolutely sure it is visible in your profile, I have to have a way to contact the winner. The winner will be chosen by random.org and announced here as well as emailed and will have 48 hours to contact me or respond to notification or a new winner will be chosen. This giveaway is open to residents of the U.S. and Canada only. A big thank you to Hatley for providing a Social Butterflies Girls' Play Set for me to review as well as the Play Set of choice for one lucky giveaway winner. The opinions shared are my own and honest and if you really need to see more, click here to see how I roll. The wild pirate rain boots are super cute! They really do have some quality clothing! I have to say the watermelons girl play set. I like the Flamingo girls' play set. i like the Creepy Bugs Boys' Play Set for boys. I love so many things but one of my favorites is the Watermelons Girls' 2 Piece Swimsuit. Watermelons are a sure sign of summer in this house!! I love the whale of a good time swimsuit! I entered the cut sew creations giveaway! I entered the little pea giveaway! It is hard to pick just one! 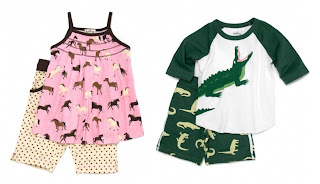 I love their Prize Pony Girls' Summer PJ's and the Rosy Afternoon Smocked Girls' Sun Dress. I like the Trailing a Little Behind Coverall and Knot Cap. Such cute things! I love the "bearly sleeping" sleep set! I love the Later Alligator Boys' Play Set!! My fave is the social butterfly set in a size 2. Though my son would love the dinosaur umbrella! 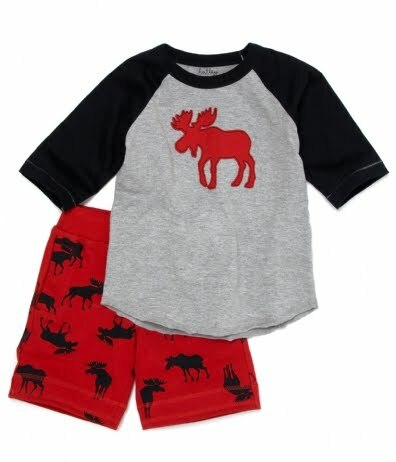 gotta say i love the Red Moose on Black Socks. The Watermelon girls' playset is my favorite! I love the rosy afternoon smocked girl dress! I really like the Social Butterfly Sundress. I really like the Big Eater Kids' Melamine Dish Set! My daughter would love the octopus! I Like Hatley on Facebook. I wrote on Hatley's Facebook wall. I entered the Lime Rick giveaway. I entered the Little Pea giveaway. I entered the Zoobi giveaway. I entered the KidsCraft giveaway. Pink Bears Infant Footed Coveralls! I like the boys pjs, they are all soo nice, hard to pick anything,because it is all so nice! 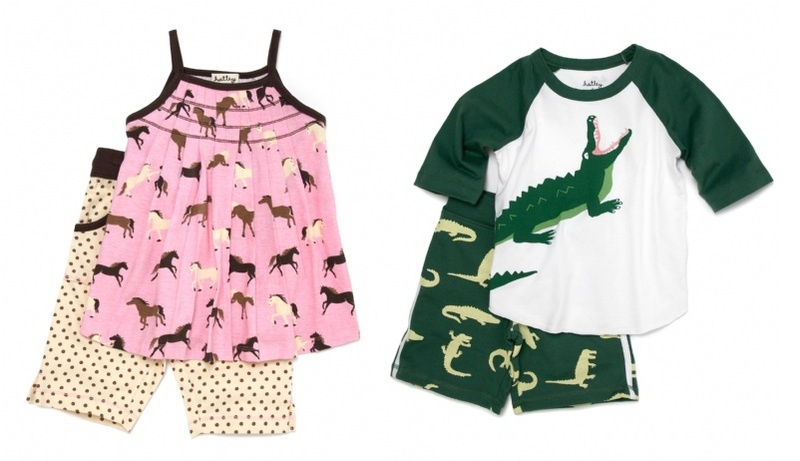 I like the Desert Horses Girls' Pant and Tank Play Set. I Love the Creepy Bugs & Later Alligator Boys' Play Sets. 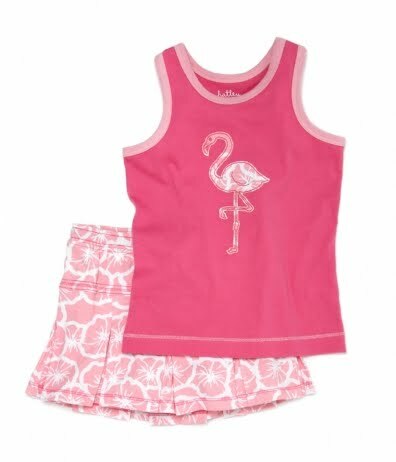 For my daughter I like the Flamingos Tiered Girls' Sundress. They have darling stuff! I Like Hatley on Facebook. jemme e.
I left the designated mssg on their fB wall. jemme e.
I entered the Lime Ricki giveaway.